April 30, 2014 by Beau H.
The Stuhrling Original Classic Ascot Agent. 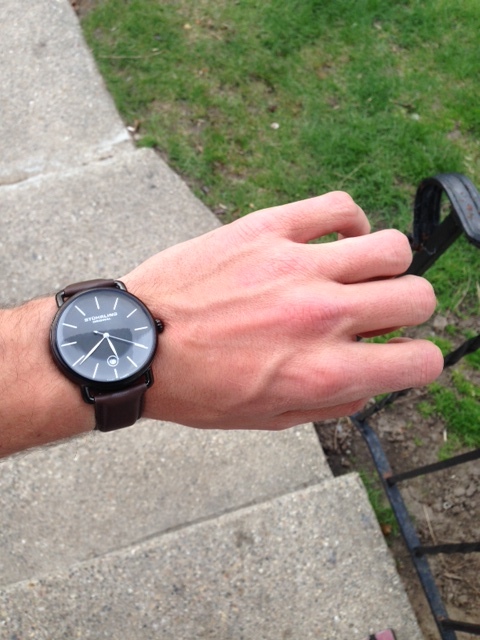 With brown leather and a black dial. With smartphones and the like so ubiquitous nowadays, it seems watches have been steadily disappearing from the wrists of men (and even women) for some time now. There’s no mistaking that a smartphone can feasibly do just as well as a watch when telling the time, but a watch — at least from a guy’s perspective — really has the potential to do so much more. It’s one of the only ways a man can express himself in terms of accessories outside of piling on bracelets, something that’s kept hanging on despite reaching a peak last year, it seems. And a watch, as others have noted, is the perfect way to diversify an outfit — be it with a dress watch, a stainless band, or another option. That’s why I’m such a big fan of wearing a watch – it provides a daily consistency, and can set the tone for an outfit. A Timex Weekender? Perfect for, you guessed it, casual weekend wear. A sturdy dive watch, as linked to above? Great for dressing up a casual outfit or keeping a sharp look well-grounded. 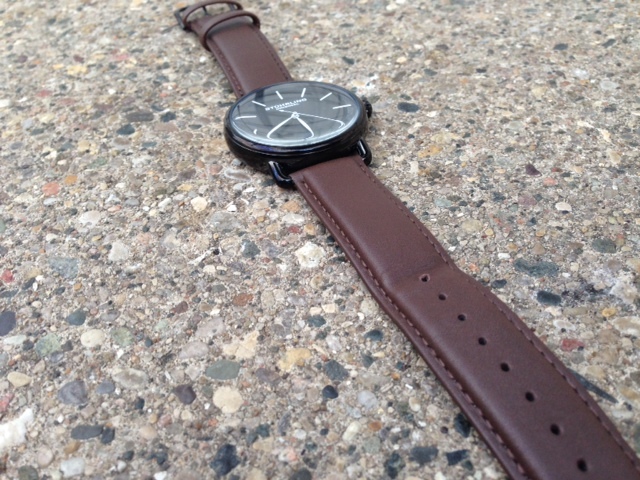 And even in the summer, it’s tough to go wrong with a minimal, sharp leather dress watch. After a few days of wearing my Stuhrling Original “Classic Ascot Agent” Watch, I’m certain this will become a go-to timepiece (namely, because I personally enjoy wearing brown shoes so much). 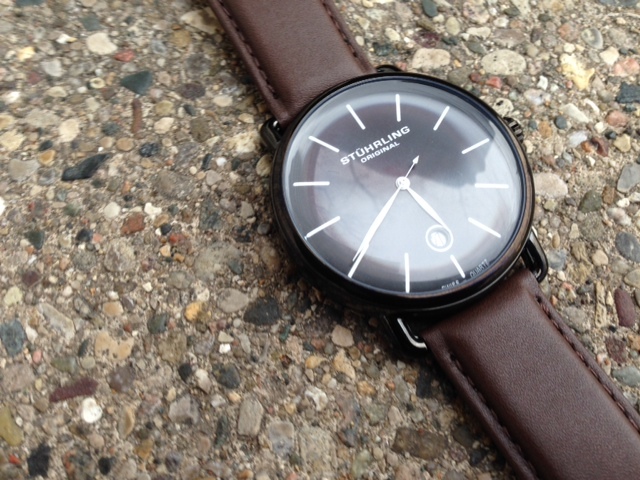 As a fan of the Stuhrling brand too, the quality seems on-point. Now, pricewise, it’s no Omega, but when you can grab it on Amazon (as I did) for a ridiculously low markup, it’ll act as a great holdover from a reputed brand for the price. A closer look at the crisp white markings on the black dial. Now, there’s definitely something to be said for mixing up different watch bands in the warmer months (read a review of a paisley strap by The Knottery here), but a brown leather strap is hard to beat. This Stuhrling model is a bit out of the norm, as it combines brown and black, but that combo definitely works on a watch. The watch face is incredibly minimalistic, a personal favorite when so many watches try to add a lot of bells and whistles.The white markings stand out crisply against the black background, and the black-and-white combo actually makes the brown leather look more rich. Now the genuine leather strap certainly isn’t like a Horween leather strap from the guys at form-function-form, but it’ll do the job. The watch itself wears at a not-too-large, not-too-small case diameter of 42 millimeters — a little larger than the traditional dress watch, but with an added bit of beef that makes it more acceptable for casual wear, too. It certainly doesn’t overwhelm my smaller-than-normal wrists, by any means. 42mm case diameter, a little larger than a normal dress watch, but no less wearable. To boot, the Amazon listing says it’s water-resistant to 165 feet — a nice touch, but this isn’t a dive watch or a sturdier rubber-strap option, so it’s best to keep it away from the water. The crown doesn’t wind too loosely when changing the date or time, but where some might take issue is the fact that it’s a quartz watch, not an automatic — a big debate in the style world. But for $50 on Amazon, there shouldn’t really be any qualms over paying that price for a quartz watch. And that’s really the main point here — for $50 (on some sites), you can get a great-looking, incredibly clean and minimal dress watch that’s also suitable for casual wear. If you’re in the market for something like that, you can’t ask for much more. April 18, 2014 April 18, 2014 by Beau H.
A short-sleeve shirt (or a polo) can be the perfect style pick for spring and summer. Shirt by Express. Jeans by J. Crew. Sunglasses by Ralph Lauren. When the weather warms up, some key style moves can make the transition from fall or winter to spring decidedly easier. In the shirting department, we’ve seen some critical trends pop up in recent months, especially the resurgence of the short-sleeved collared shirt. While that’s certainly a style move worth exploring, the first (and perhaps easiest) way to make the transition is with a simple polo shirt. That’s not to say that long-sleeve collared shirts should take a break permanently from your wardobe; rather, think of the polo as a worthy substitute on more days. It might bring to mind a bland uniform look, but even James Bond wears polos now. Although it’s an item most of us have had in our closet and worn for years, the biggest way to upgrade the look now revolves around some main keys, starting with fit and moving on to color. With spring officially here, reach for a polo and matching shorts. Navy polo and shorts by J. Crew Stanton. Belt by Target Merona. Glasses by Burberry. Think of the polo as a the warm-weather version of an Oxford cloth button-down.The polo is virtually fool-proof as a casual (or sharp) item when it comes to your top layer in terms of versatility — it can be worn to class, to work in a fairly casual environment, and out to dinner or drinks on a patio. But, what helps with versatility is fit. Retailers now are stocking slim-fit polo options at great prices by the dozen, and that’s exactly how the ideal polo should fit, even if you have some more bulk. The sleeves should hit about mid-bicep, and the fit through the torso should be clean — think minimal extra fabric bunching around the sides or waist. Once you’ve nailed the fit, it’s a wise bet to experiment with color. The lighter, warmer weather of spring is the ideal time to work some more vibrant colors into your wardrobe — something like a crisp, clean white is a nice place to start, but unique shades of red and light blue are also fairly versatile additional colors to start with. And if the fit of the polo is right, experimenting with some pattern can be more easily done — take a look at the rest of the Michael Bastian X Uniqlo collaboration for some extremely competitively-priced patterned polos. 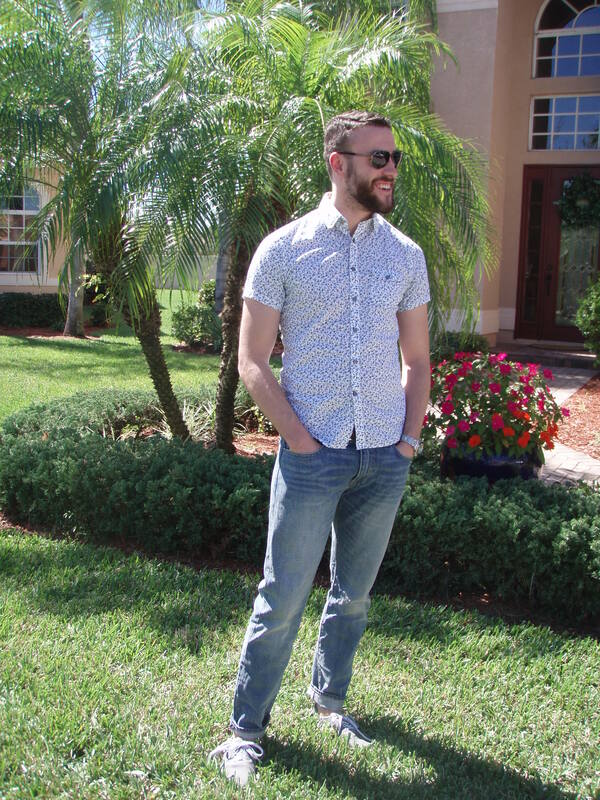 A slightly more unique take on light denim paired with the short-sleeve shirt. Canvas sneakers by Urban Outfitters. Short-sleeved shirts also are another easy way to mix things up in your closet. The short-sleeved shirt has gained a bad reputation in recent years (think Dwight Schrute) but recent updates on the style are a far cry from that. Like the ideal polo, the short-sleeved collared shirt incorporates a slimmer fit through the sleeves and body. 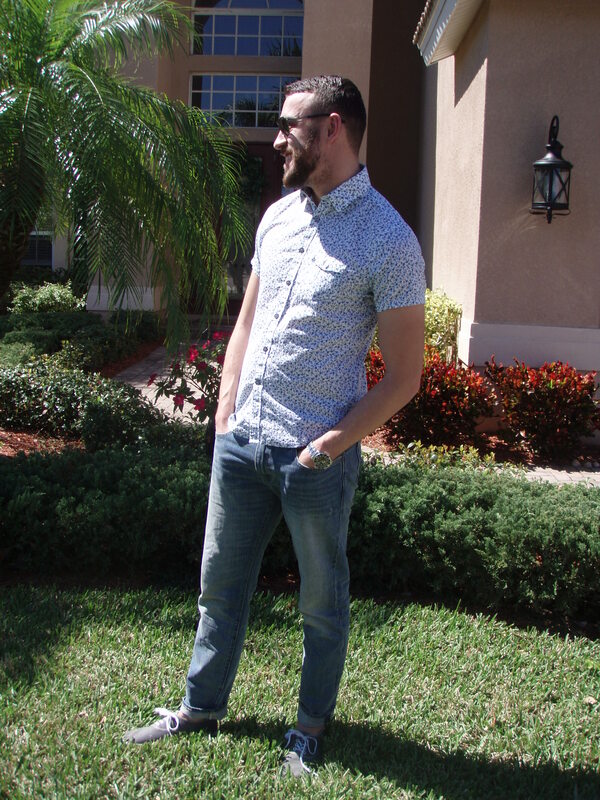 Picking a shirt with a bit of a pattern or stripe to it mixes up the bad stigma of the short-sleeve dress shirt even further (ASOS offers a wide variety of short sleeve shirts with patterns and prints at nice prices, to start). And with both the polo and the short-sleeve shirt, the possibilities for what you do with the rest of your outfit are pretty limitless also (as long as your bottom half matches nicely in terms of color with the top half). 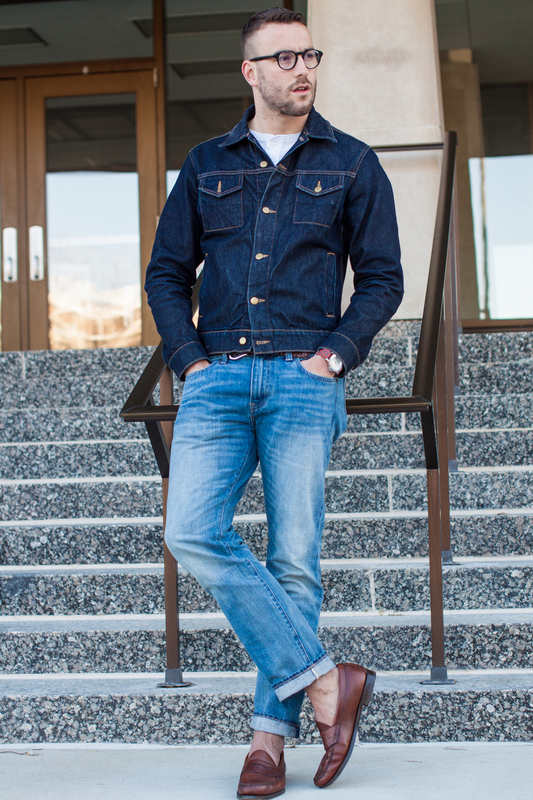 Dark denim is a nice anchor to any outfit, and in the spring and summer, lightwash denim (as pictured above) works well with various neutral shades. 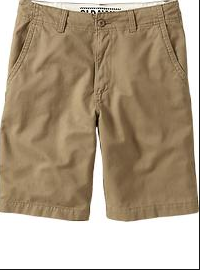 Shorts in neutral colors (think a dark or light khaki) downplay the loudness of a printed shirt or polo, too. So the next time you reach for a long-sleeve shirt in the hot weather, turn instead to a short-sleeved variety, or a polo, with some color and pattern. In the right cut and style, it’ll keep you on trend and also sharp — just about all you can ask for from a piece of clothing. April 11, 2014 April 11, 2014 by Beau H.
Warmer weather means it’s time for shorts. Navy polo and shorts by J. Crew Stanton. Belt by Target Merona. Glasses by Burberry. With what appears to be the arrival of spring here in Michigan (finally! ), it’s time to unpack some essentials from the closet. Spring bring with it breezy weather, sunshine and some occasional rain, all of which necessitate dressing differently than other parts of the year. Fall brings in colder temperatures and winter brings in chilly snow, meaning those parts of the year are about increasing the weight of textures and adding visual interest to outfits through unique layers. With spring here and summer upcoming though, this time of year is all about lightening things up — in weight, color and texture. These can be done through simple combinations that can easily rotate in and out of a personal uniform — an incredibly helpful and useful style move that can solve even the biggest conundrums. An easy upgrade to start comes with the occasional move from pants to (gasp!) shorts. Now, there’s a difference between putting on shorts and putting on shorts (kind of like the difference between a dinner jacket and a dinner jacket). Forgo bulky cargo pockets for something more streamlined, like this Old Navy pair. Khaki works, but also look for color! The right pair of shorts fall right in line in terms of fit with the best pieces in your wardrobe — as in slim or tailored. This means that cargo shorts should be thrown out altogether, as there’s too much fabric hanging around with those extra pockets, bells and whistles (get a look at the top picture here). Several brands out there offer nice varieties of slim-fit shorts, which add a much more polished look to something as simple as a pocket T-shirt or striped henley. 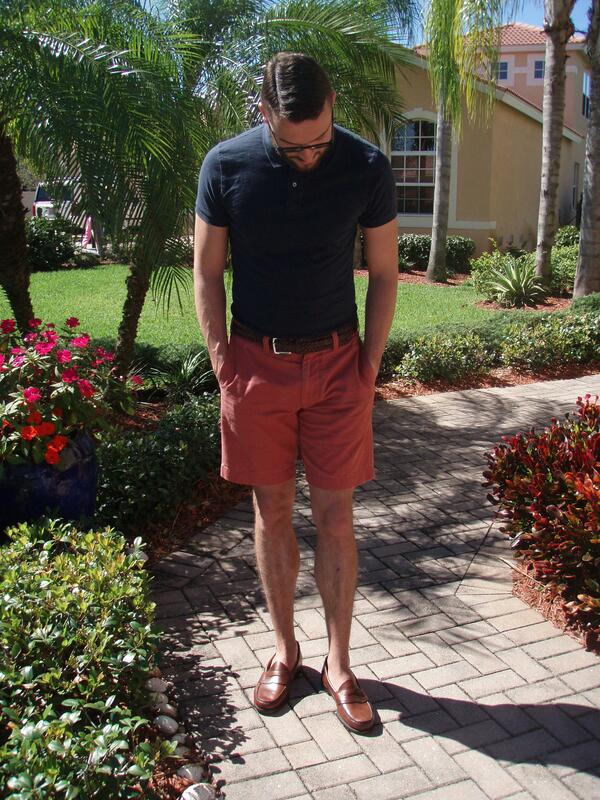 A great starting point (slightly pricey, however) is J. Crew’s Stanton short. Unless you’re exceedingly tall or exceedingly short, look for something with about a 9″ inseam, like the Stanton — that seems to hit a little above the knee for most people, creating cleaner lines and an overall more tailored look. A wide range of colors for those J. Crew shorts is a nice touch, too. The Comer Chino shorts from Land’s End also are a personal favorite — two pairs have been in the personal rotation for two years now with lots of wear, and they’ve held up great. A lower price point is certainly beneficial, as well. And because there’s less fabric on your legs, it’s OK to play around with color (for example: It might be too much to wear, say, bright blue pants at this time of year, but colorful shorts are definitely alright). In fact, stepping away from the typical khaki shades of shorts gives you more leeway to mix and match smaller colors in other parts of your outfit (just don’t go too color-crazy — keep it to one large pop of color and smaller complimentary colors elsewhere). There also are both dressier and more casual options to pair with shorts —from a simple pocket T-shirt to a blue or white OCBD, but those will be explored in greater detail in future posts, as will essentials like spring shoes. Are there any go-to brands or colors you have for shorts or other spring style items? Leave feedback in the comments below! April 6, 2014 by Beau H.
Denim on denim. Floral short-sleeve shirt by Express. Jacket by American Apparel. Loafers by Bass. Jeans by J. Crew (484 fit). Spring is one of the more difficult times of the year to find the right balance between what to wear outside and inside. There aren’t necessarily any one-size-fits-all solutions, particularly in terms of outerwear. In the winter, that navy peacoat can pull duty nearly every day of the week, similar to how a lighter-weight military jacket could work on top of other layers in the chill of fall. In the spring though, you might see a slight chill in one part of the day, and then the heat of the sun in the afternoon, for example. A standard Harrington jacket could work tremendously of course in the rain, but the denim jacket is a particularly underrated style accessory, in that it works outside and inside in multiple types of weather. It’s gotten more play over time in the #menswear community, especially in recent years, and rightfully so. Some don’t particularly like the look, but It’s definitely got a sort of rugged appeal to it that brings to mind modern-day style icons like Daniel Craig and Ryan Gosling. Of course, no mention of the denim jacket is complete with bringing up this stylish singer here. 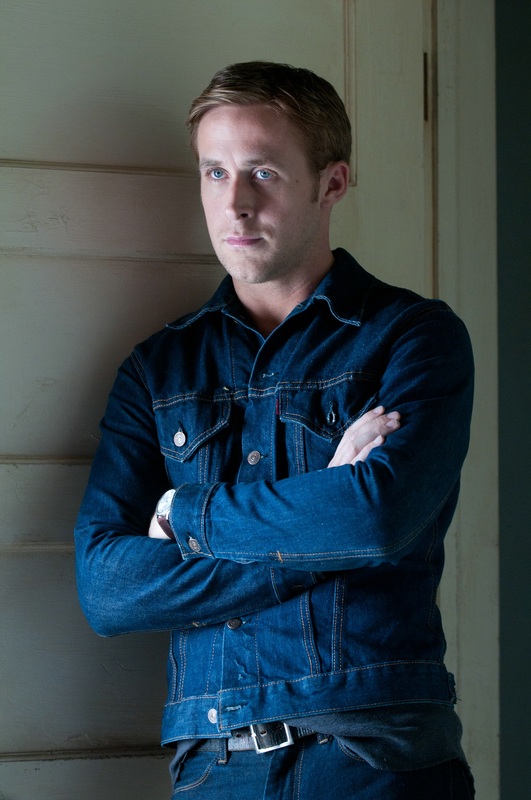 A big debate comes into play, however, on the feasibility of rocking double denim. The most important thing to keep in mind is texture and wash — keep those washes separate if you dive into this look, like the photos seen here (dark jacket, light jeans and vice versa). Rocking double denim. Jeans by J. Crew (484 fit). Jacket by American Apparel. Henley by Mossimo. Loafers by Bass. And although Daniel Craig rocks a lightwash number, the most versatile denim jacket is just like your favorite pair of blue jeans — dark blue with a modern, slimmer fit. It should hit above the waist (or about at the waist), with slimmer sleeves and a more fitted body (like this American Apparel jacket). 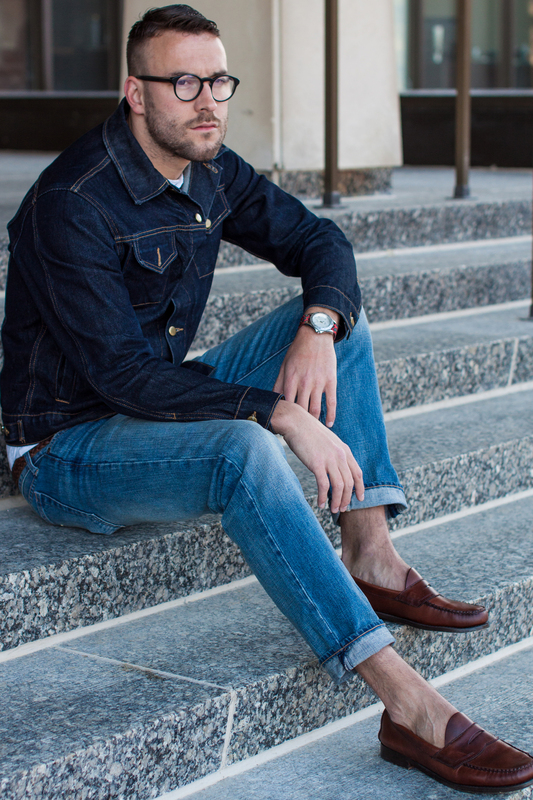 In addition to a slim cut, the denim jacket (like the one seen from American Apparel) is a great transitional outerwear piece because it’s heavy enough to wear over a plain henley in a slight chill, yet could also work when worn over something like a collared shirt. And it works with chinos or trousers — as well as denim — because it’s a dark, clean slate from which to build in other colors or textures. Glasses by Burberry. Watch by Timex, strap by The Knottery. Belt by Mossimo. It’s the rugged man’s answer to the navy blazer in these modern times — because (ideally) the jacket is dark blue and fitted, it can function just like the blazer while lending more functionality in terms of an outer layer. Unlike the navy blazer however, it can definitely take a beating, and it doesn’t need to be treated with the same sort of reserve as a blazer. It can stand up to a slight rain and some chill, which actually might give it more character. And a medium or lightwash number is yet another piece to consider adding when you need to mix and match types of outerwear. 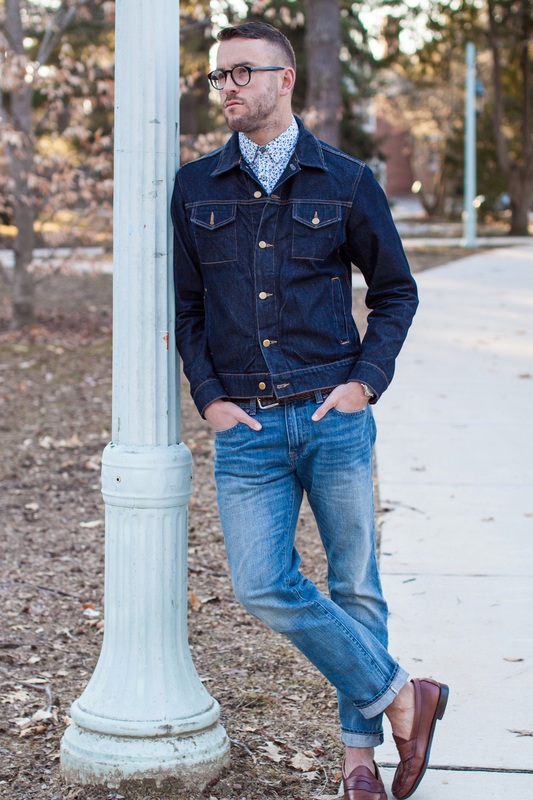 Another denim-on-denim shot. Mix up the casual nature of that jacket by pairing it with a printed shirt. Like so much of American style nowadays, it also brings to mind Western and workwear-inspired vibes (a personal style favorite). 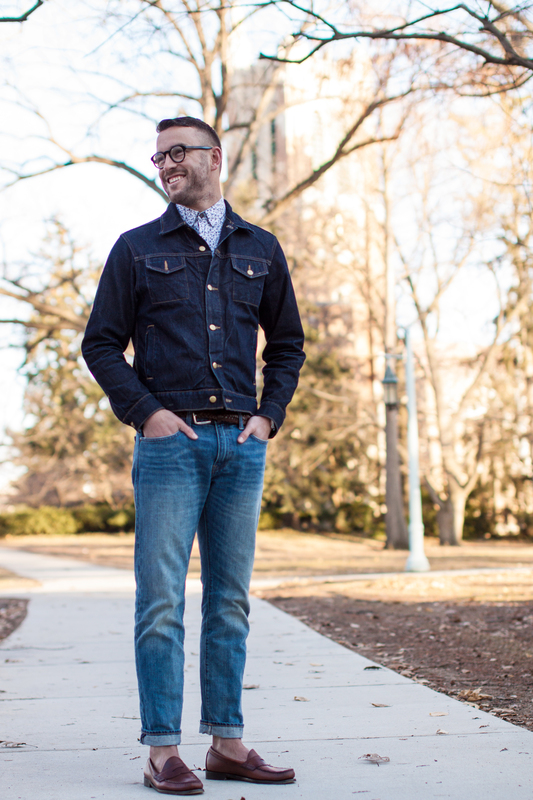 And over time, a denim jacket can break in like your favorite jeans, telling a uniquely personal story that reflects who you are and the way you dress — a lot of mileage out of one jacket, right?